All the performance, but less weight. That’s the promise of H2O Canoe Company’s voluminous 17-foot river tripper. The Voyageur caught my wandering eye early this spring as local runs began to flood. Rather than lug my trusty ol’ 80-pound Royalex behemoth to the river’s edge, I visited H2O founder Jeff Hill at his workshop in rural Tavistock, Ontario. I brought back with me the lightest heavy-duty river tripping canoe any of the Paddling Magazine editorial staff have ever paddled. Not to mention, we’ve never used the words lightest, canoe and heavy-duty in the same sentence. The shape of the voyageur was sketched out more than two decades ago. Back in 1997, celebrated boat designer Skip Izon dreamed up a tripping canoe for London, Ontario-based rowing shell manufacturer Hudson Boatworks. Izon had the goal of creating a canoe that excelled in whitewater, while remaining efficient on the flats. In the 21 years since, his design has been known by many names and manufactured by four companies. We first reviewed Izon’s design back in the spring 2003 issue of Rapid, when it was called the Nemesis and manufactured in Royalex by Raven Works (www.rapidmedia.com/0793). After Raven Works folded, the Nemisis mold went to Scott Canoe where it was used to produce a canoe named the Missinaibi—its namesake a northern Ontario river known for its excellent whitewater and lengthy flats. Then Scott Canoe’s parent company, Mid-Canada Fibreglass, closed its doors in 2013. H2O acquired the original cedarstrip prototype from Izon’s workshop—Izon was still paddling it all these years later. Using the original plug to create a mold in 2016 Hill started manufacturing another new canoe in an ultra-durable composite construction. Two decades after the original incarnation, Izon’s design lives again, this time modernized in material but traditional in name—the Voyageur. Thanks to H2O’s proprietary Brute Force layup, the Voyageur dropped 25 pounds compared to its previous Royalex incarnations—as a point of historical reference, that’s roughly one-third of a voyageur’s bundle. In the Brute Force layup, polypropylene-based Innegra fibers are woven with basalt mineral to make an outer and inner skin. A center layer of Kevlar and Kevlar ribs laminated with an impact-flexible epoxy resin round out the composite sandwich. Certainly, the svelte 49 pounds is impressively light for such a large and tough whitewater canoe. H2O debuted Brute Force in 2016, back when the canoeing market was still reeling from the loss of Royalex. It was a dark but exciting time in canoe history. 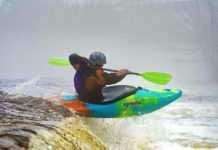 Manufacturers were experimenting with all sorts of different composites to find a suitable replacement for plastic recreational canoes and river trippers. However, the release of a Royalex-alternative material later the same year swung much of the market interest back to plastics, says Hill. But not all. “There was a period of time when everybody was looking for composite solutions. Now many of those same people just aren’t in the market anymore. There’s a familiarity factor with plastics, but also the price of plastic canoes is lower,” says Hill. “Our audience in 2018 is middle-aged and older people who are not interested in river tripping with an 80-pound canoe.” He can add to his list one 30-something editor. Brute Force can handle just about anything the river throws at it, says Hill. 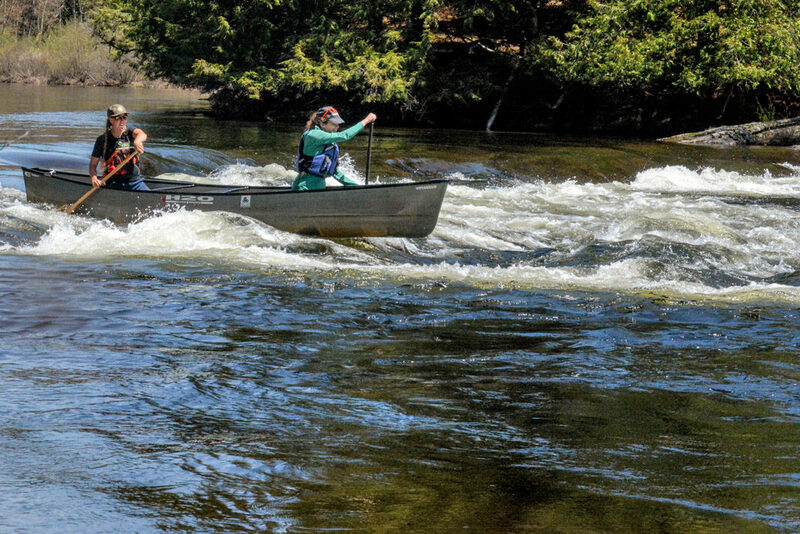 Of course, just like any composite canoe, the Voyageur isn’t an ideal boat to simply bash down your local run—the material will stand up best in competent hands with intermediate skills. You will have to learn to turn and pick your lines,” says Hill. 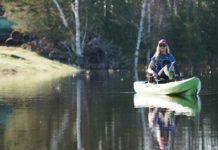 “The Voyageur is capable of handling any level of paddler, but it’ll demand you develop your skills too. On flooded spring rivers following a late ice out, we found this tandem tripper to be all Hill—and Izon before him—promised. Thanks to aggressive four-inch rocker in the bow and two inches in the stern, the Voyageur is a quick-turning canoe for a 17-footer, carving in and out of eddies with ease. It’s a dry ride, with plunge-resistant overhangs and flare in the bow and stern. Izon kept the waterline sharp for flatwater and flared above the waterline for crashing through big standing waves. 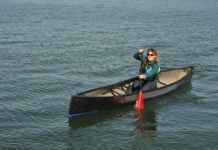 The Voyageur is also a deep canoe, with 21 inches in the bow and 15 inches at center. 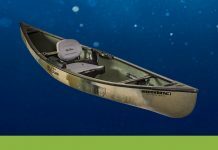 An ultra-broad 37-inch beam makes the Voyageur feel oh-so stable at any time, and tumblehome in the paddling positions narrows up the width for easy strokes. Few good rivers trips are all rapids. The Voyageur was also designed with flat-water efficiency in mind. This shows in the sharp entry lines of the bow and stern. At the waterline, the Voyageur is more reminiscent of my touring canoe rather than my bulbous weekend playboat. “It’s a big, friendly boat. It’s easy to design a big canoe to carry a lot of stuff, and make it very maneuverable,” says original designer Izon, who restores canoes and rowing shells in his Grand Bend, Ontario workshop. “The challenge was to build some speed into it.” He used his expertise in designing rowing shells to shape the Voyageur’s bow for optimal glide. I’d be remiss not to mention the extravagant interior space the Voyageur provides. I think I could fit a quartered moose in here or 1,000 pounds of fur pelts and salted cod. For sure it fits four blue tripping barrels—if that’s more your style. We often refer to the Voyageur by the name Skip affectionately gave it early in the design stage—Big Mama,” says Hill. The extra room at the center of the boat is appreciated because the sharp entry lines at bow and stern cut down on usable storage space in those areas. You won’t notice this if you’re packing flotation, as Hill recommends. Our loaner came standard with webbed seats, ash yoke and aluminum trim. 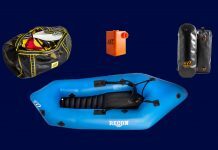 For serious river tripping, we’d recommend whitewater outfitting, including knee pads, straps and air bags. “I’m just happy she’s found a home all these years later,” says Izon. In his garage, Izon has a new boat hanging next to the original cedarstrip prototype he loaned to Hill. It’s white, made of Kevlar and he calls it Big Mama, too. We bought the Voyageur after seeing Scott interview Jeff on YouTube at the Toronto Outdoor show. We’ve had it full a few times but never on serious white water and I think it works better when loaded. It would turn on a dime at Palmer Rapids last summer into any Eddy. Please post any more trips you use it on. Don, I agree. It settles down with some weight in it. Maybe see you here at Palmer in the spring.